Well, I almost didn’t make these Berry-Buttermilk Pie Bars, but then I felt a little guilty this morning and since I was up early anyway, I decided to throw them together. However, things did not go exactly to plan, or rather, to recipe. I made the crust and baked it off…felt tight on time because I had a morning gym appointment (which takes priority over all else in my life…seriously) to go to, so I didn’t let it cool before pouring on the buttermilk custard filling. This didn’t seem to affect the bars at all, and I think it may have helped to quickly set the custard, which was a very loose mix, on the edges. The recipe called specifically for fresh blueberries, which I didn’t have. I did have frozen, so I used those. But then I didn’t have enough, so I also sprinkled in some frozen raspberries. I put the pan back into the oven and then at the half-way point realized I really needed to head for the gym. I decided to just turn the oven off and leave them in there until I got home. That’s what you would do, right? Maybe not. I had no idea what I would find when I returned an hour and a half later. Guess what? They were perfect-haha! I love it when I half-a$$ something and it works out– usually this is not the case! I’ve never had buttermilk pie before and I like these a lot. 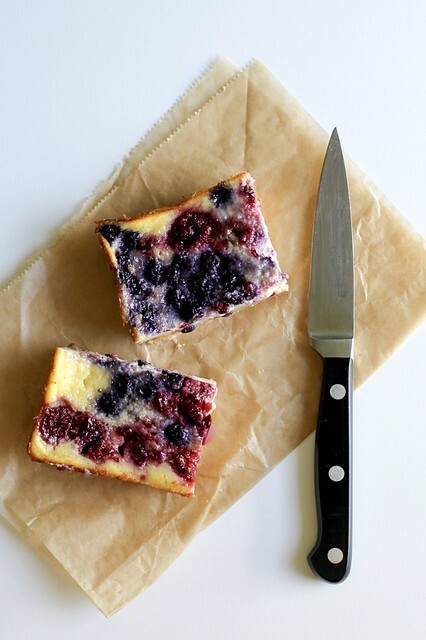 The crust has a nice crunchy sandiness from a bit of cornmeal, and the tangy buttermilk custard filling goes really well with the berries. Yum! I like the idea of throwing in raspberries. I’m glad your improvising worked out well. gosh these look good. Would be perfect wit a cuppa. Wow! They look great! I lived these bars. I like your “can do” attitude! Did your custard stay put on top of the crust? I’m not sure how to prevent it from going underneath as it baked? yeah, it didn’t leak down too much. it may have been because i didn’t cool the crust before i put on the filling. the crust didn’t shrink more as it cooled and the filling sizzled in the pan and maybe set the edges quickly. I literally gasped! That bar is sooo beautiful! Oh this looks like something I would love (and eat for breakfast, lunch, and dinner:)! These look so yummy and the market is bursting with fresh berries right now! These pie bars look incredible! Only an extremely accomplished baker could pull off what you pulled off with these…if I had done that they would have had to be trashed for sure…seriously you are amazing getting them to work out so beautifully. And they are just beautiful!